My response, “I’ll take the blame. I’ll accidentally forget the exchange of rings and she can be mad at me and not you.” But he didn’t want to do that. I have learned there are sometimes awkward moments when things like that happen, I can often take them and turn them into light hearted moments. 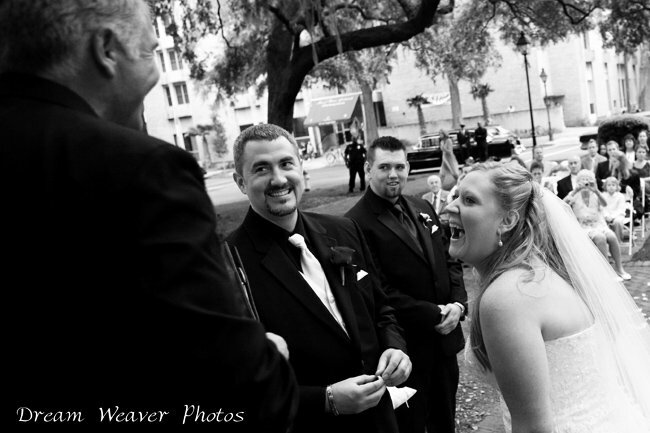 The following photo is an example of “Oops, I forgot the rings” and instead of tears, there was lighthearted laughter. In this case, after the ceremony, I asked if I could go to their reception location and bless the real rings and then have them exchange the real rings. Should rings be put on the pillow for your wedding in Savannah? Rings, small detail. Yet can be… well… it can be embarrassing for the ring bearer if the rings fall off the pillow or the bow becomes a knot. So what is the solution? People don’t tie their shoe strings all the same way. So the simple solution is let the untie-er be the tie-er. Another solution is to have fake rings on the pillow. Then someone in the wedding party can carry the real rings. Yet another solution is … Let me know if you’ve tried something that worked.